Indium Corporation’s Indium8.9HFA Solder Paste is a versatile, halogen-free, Pb-free, solder paste with leading print performance on miniaturized components. Assemblers and OEMs are adopting this remarkable new product at an accelerating pace. Print performance is especially critical for manufacturers of mobile phones and other personal electronics devices as they struggle to contend with sub-8 mil challenges associated with continuing miniaturization in the electronics assembly industry. Indium8.9HFA Solder Paste is part of Indium Corporation’s Indium8.9 series of solder pastes. The series was designed to provide multi-faceted performance characteristics, bringing the right balance of solder paste attributes tailored specifically to your manufacturing process. Each paste in the series was developed to optimize print performance and mitigate common defects faced by manufacturers of personal electronics, such as QFN voiding, head-in-pillow, and graping. 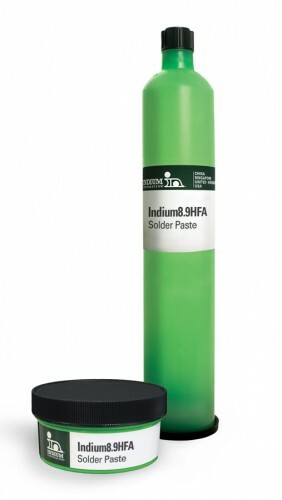 For more information about Indium8.9HFA or the Indium8.9 series of solder pastes, visit www.indium.com/indium8.9series or email askus@indium.com.